You should use these fields to collect information about the individual coming to your event. You should try and use these fields wherever possible, as this information will be saved for your attendee's (and their friends) on subsequent bookings. Attendee fields will only be asked per attendee on a booking. Booking fields are for booking information - they're not event specific. An example might be a field which asks whether the booking is for a gift, how the booker first found out about the event, or whether they'd like to be signed up to a newsletter. Fields can be used to ask for details specific to the tickets selected for each event. So they appear per ticket and per attendee. An example might be a menu choice for an event - it's not a piece of information about an attendee, but more about their preference specific to a certain ticket. 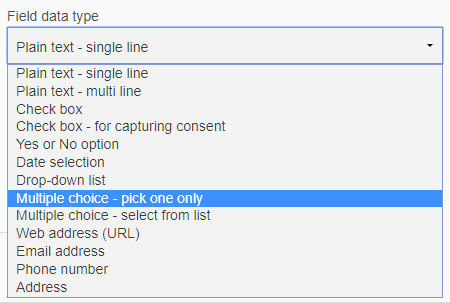 Wherever possible try and use a field form that helps you validate the information you're asking for. For example use date selector for date of birth, and phone number when asking for someones contact details. If you have any questions about getting your booking form set up then please give us a shout - we're always here to help!